Hello! Where did August go?? It seems it was just yesterday that I was wondering what happened to July. Don't you just love to see Sunflowers in bloom? .... they are such happy flowers! 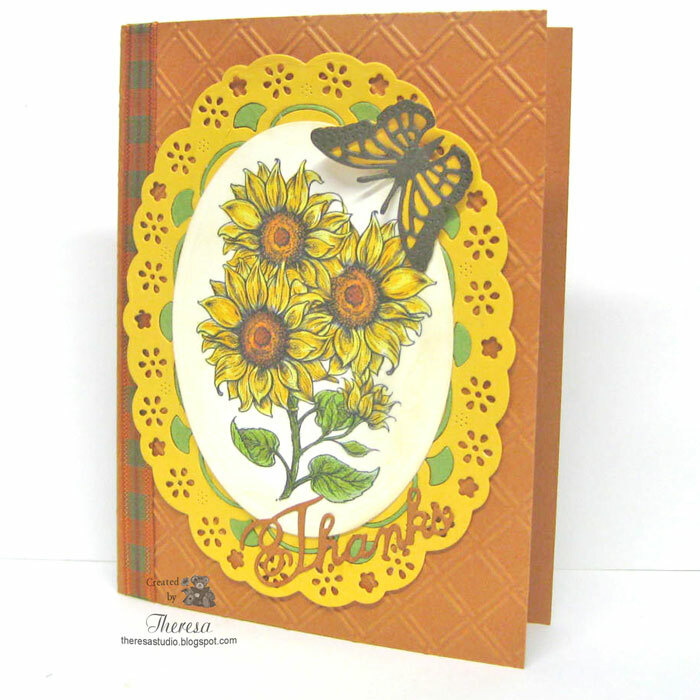 I love coloring this Power Poppy digital image of Sunflowers cut with an Oval Die. I used Copics and framed the image with Cheery Lynn Swedish Spring Oval Frame die cut from Gold CS. I cut the frame a second time in Green CS and used some of the small green pieces to "inlay" in the frame. I love the extra touch of color on the frame. I placed the image on an embossed Card Base of Pumpkin Spice CS that I had wrapped with a plaid ribbon with gold threads. 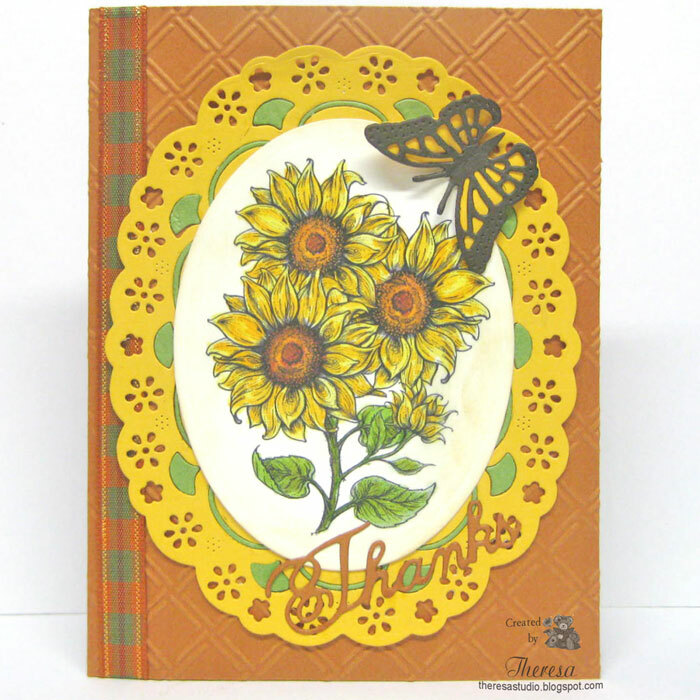 I added the word Thanks cut with Cheery Lynn Thanksgiving die. 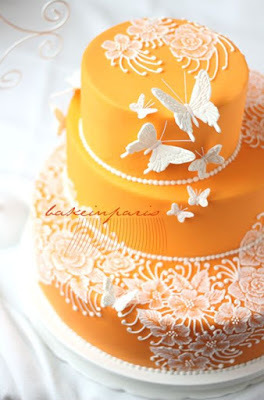 As an afterthought I added a layered butterfly die cut with Cheery Lynn Small Exotic Butterfly and Angel Wing dies. Cheery Lynn Designs Blog: Challenge #200 is Frame It. Used 4 Cheery Lynn dies in my design. 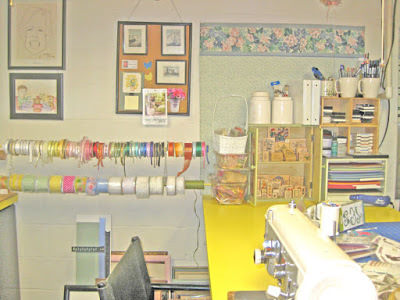 Crafty Ribbons Challenge: #125 is Butterflies and Birds-use one or both with ribbon. Alphabet Challenge: N is for No Design Paper. Hello! I hope your weekend is going great! I took time to make a card for some challenges about travel and tickets. I was thinking about a bulletin board made with ribbons to hold memorabilia as I designed my layout so my card resembles a board holding tickets attached with paperclips on bands of organza ribbons. I stamped the Baggage Claim Ticket (cut out from pattern paper) with a sentiment from Heartfelt Creations with Memento Espresso Truffle ink. This ticket was attached with a brad so the ticket can move to reveal a message underneath. 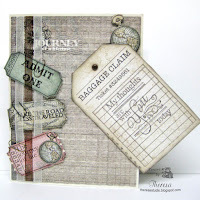 I will add that when I use the card and thought it would be appropriate to wish Bon Voyage, Happy Retirement or even Happy Birthday, etc.. All pattern papers are from Heartfelt Creations Celebrate the Journey Collection papers. 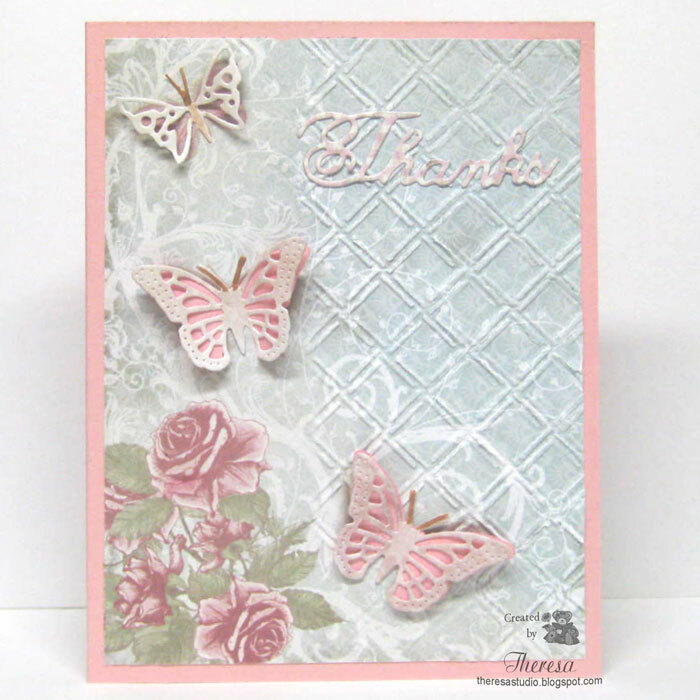 The card base is Oyster Pearl Glossy CS from my stash. Tiny paperclips are from Ranger and ribbons and brad are from stash. 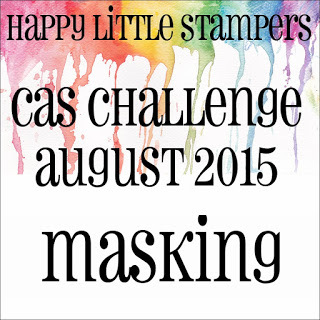 Simon Says Stamp: Monday Challenge is Ticket, Please! 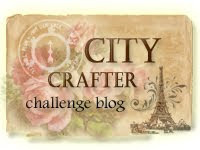 City Crafter Challenge Blog: Week 276 World Traveler. Inspiration board on right. Inspired by the tickets and colors. Hello! I do not ever remember seeing 2 challenges have the same photo for a inspiration challenge and especially posted on the same day. So, I am doing double duty with one card. 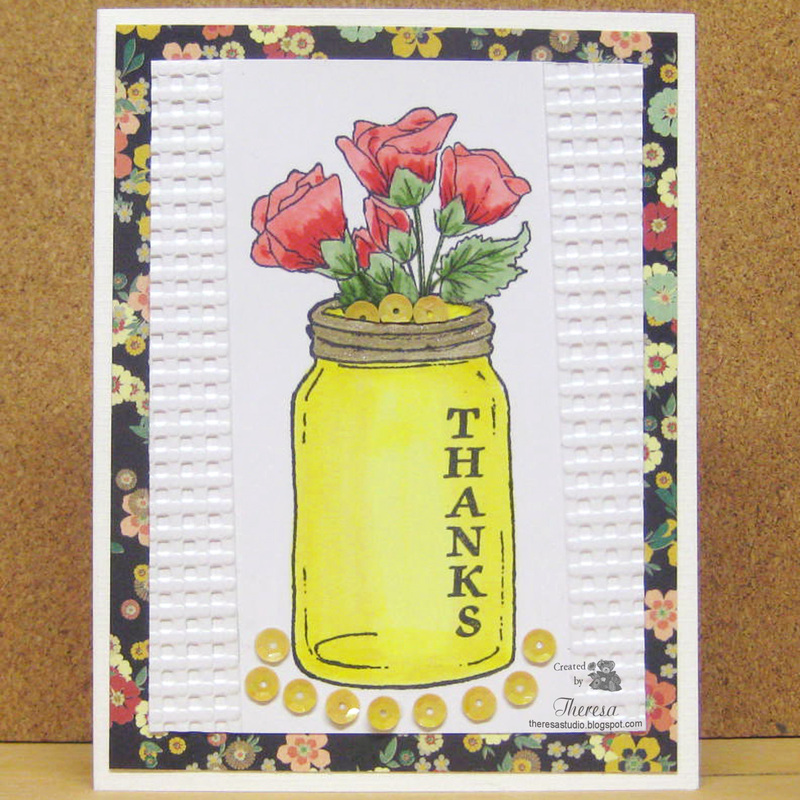 I stamped the Jar with a GKD Stamp from Buds & Vases, masked the jar, and then stamped the flowers from the same set again using Memento Tuxedo Black. I colored the image with Copics R22,24,27, Y06,13,28, G21,82. I added some sparkle with Sukara Clear Star pen and with Yellow sequins. 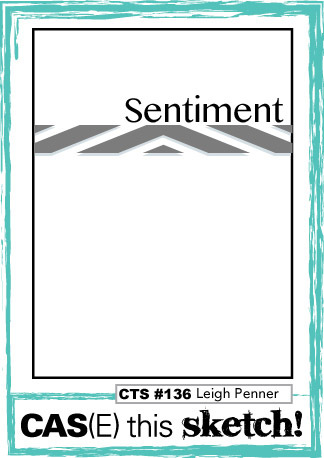 The sentiment is from Repeat Impressions Vertical Sentiments. I used a Pattern Paper from MME Market St. pad because it has all the colors in the Photo.....pink, green from the pencils ....also black, reds, yellows. I also embossed the sides of the image with EF Gingham inspired by the stripes in the photo and angled a bit for some interest. Curtain Call : Oops missed the deadline for this one. 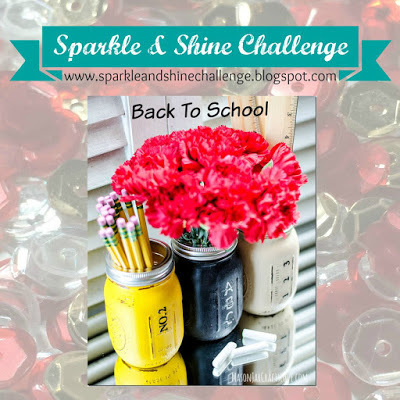 Sparkle & Shine: Photo Challenge on right. Made this a Thank you card since you sometimes need one for Back to School. Inspired by the jars, flowers, colors. AAA Cards: #46 Challenge is Maskerade-I used the masking technique. Welcome to the studio! Today I have been playing with Power Poppy new Sunflower digital image and created a bouquet of sunflowers using Photoshop. 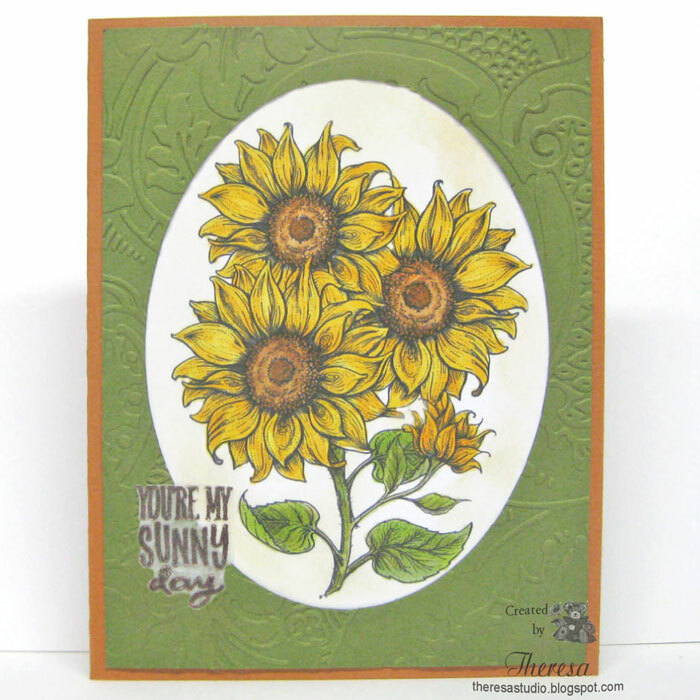 This is kind of like using the masking technique with stamps but I layered and grouped the sunflowers digitally and printed as one image. I am showing the stamp from Power Poppy below which shows the single sunflower that I used. To be able to alter and change digital images is one of the benefits of using Digis. After printing the image on white CS, I colored with Copics Y13,17,38,E34,37,97, YG 03,63,9,95. I framed this with a Layer of GKD Fresh Asparagus CS to which I made an opening with an Oval die. This was embossed with Cuttlebug EF Anna Griffin Acanthus. I used this EF because I think the embossed design has a vintage feel. I sponged the image and embossed surface with Distress Ink Antique Linen to also add to the aged look that I was going for. I used a card base of rust/brown CS. The sentiment from Power Poppy Summer Harvest was heat embossed on clear vellum with Wow Chestnut EP and attached with vellum tape. 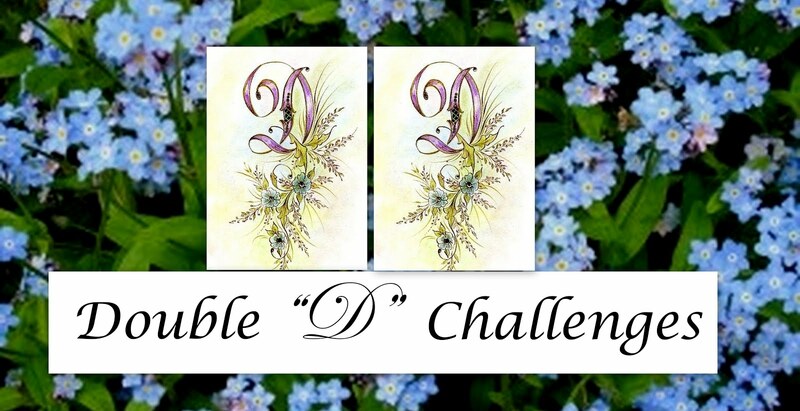 The Shabby Tea Room: The challenge for Week #258 ABC-123 is to make a card inspired by the photo on the right. I was inspired by the sunflowers and colors. 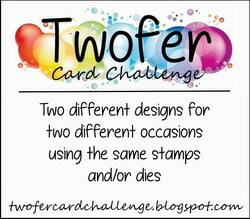 To tie in with the title of the challenge, I used 1-2-3 Sunflowers in my design. 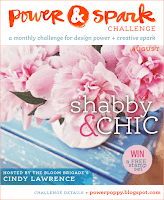 Power Poppy: Power & Spark Challenge is Shabby & Chic. I used sponging with distress inks and embossing that gave this card some shabbiness and I think the Sunflowers are so Chic, don't you. Hello! 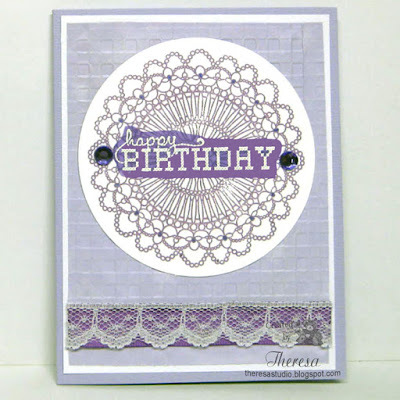 I had 2 challenges in mind in making this card--the challenge at Stamp TV to Count Your Layers and the Mod Squad Challenge Lavender and Lace. From my stash, I pulled out some solid and pattern lavender papers and ribbon and lace to begin. I stamped the lacy doily from GKD Nana's Needlework on white CS with Memento Lilac Plum and cut with a circle die. I layered this on a lavender pattern paper embossed with EF Gingham and added Satin Ribbon layered with White Lace. This was attached to a White layer and then a textured Bazzill Lavender card base. I added the fussy cut sentiment from GKD Nana's Needlework Sentiment that I heat embossed on Lavender Vellum with White EP. Added some Rhinestones and touches of lavender Gelly Pen for sparkle. I count 5 layers of papers plus the ribbon and lace layers. The vellum and the ribbon are more the same color than they appear in the photo. 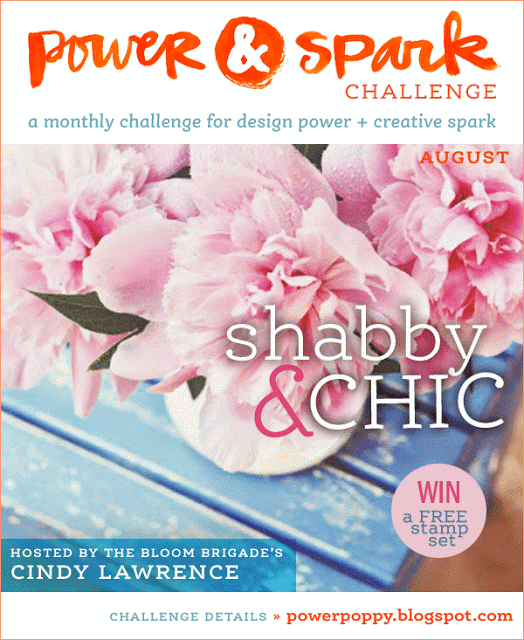 Mod Squad Challenge: Judy's challenge is Lavender and Lace. 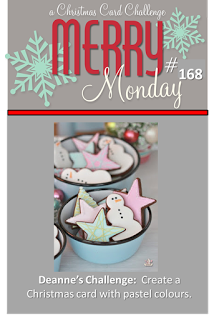 Stamp TV: Mix It Up Monday STV15Mon33-Count your Layers. Hello! Have you been enjoying the flowers of summer? Today my card is a collage of sorts with summer flowers and insects inspired by the Photo Challenge at The House That Stamps Built. 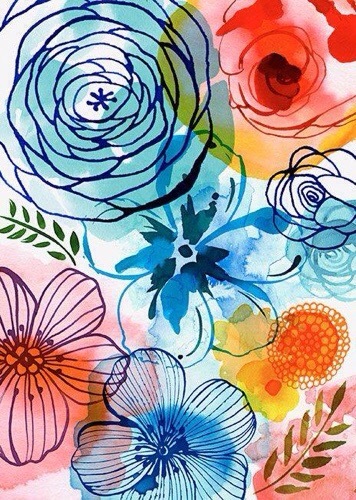 I pulled colors, the theme of flowers, and the layout (similar placement of colors) from the photo shown below. 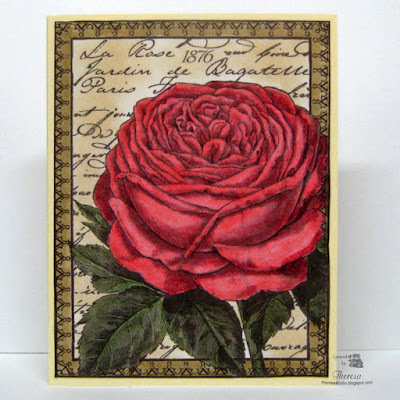 I used 6 stamps from Repeat Impressions and one from GKD, a Rose, with Distress Inks, Memento Inks, a Blue glaze pen, Versamark ink, and Red EP. Papers were all from stash including a strip of Vellum for the sentiment. This is a different look for me.....a cross between abstract, watercolor, collage and just a bit of fun of doing whatever! Great for all those Anything Goes Challenges. The House That Stamps Built: WIW Photo Challenge A1919. See Photo. 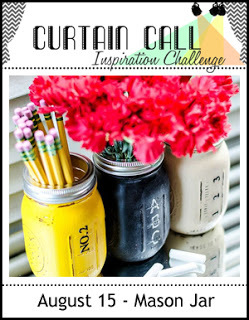 Craft Your Passion Challenges: Anything Goes. Welcome! I do not make many cards with Mermaids but this seems to be a popular theme. 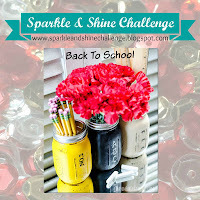 I am using the free digital image from A Day For Daisies to make this card for their Challenge to add sequins. After printing the image in the lower left corner of White CS, I colored with Copics and added some Crystal Stickles for sparkle and then attached pastel sequins. The Power Poppy sentiment was stamped with Memento Tuxedo Black ink. The card base is from my stash. This card has such a cool look. 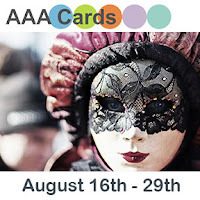 City Crafter Challenge Blog: Week 275 Around the Corner - create a card and use just one corner and leave the rest of your card blank. Welcome! I was most fortunate to have won a prize from The Shabby Tea Room this week. 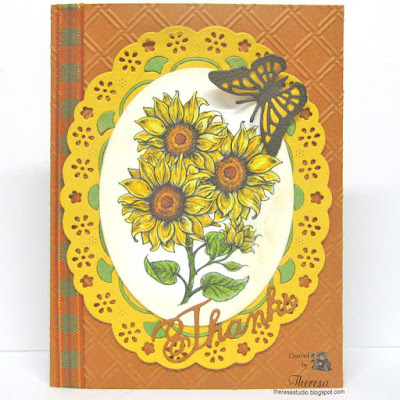 I received digital files from Crafty Secrets which I was able to select. 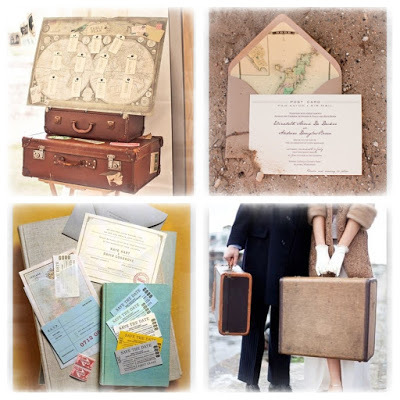 I had never been to this online shop but was very happy with the selection that I found of vintage images, papers and more. I could not wait to make a card with one of the files and quickly printed out the Rose-Script-Frame image on cardstock. This rose colored beautifully with Copics and I only used 4 markers R22, R24, G21, and Y28. It looks like I used many colors to get that look of depth. I sponged the background with Distress Ink Antique Linen. I used an Ivory CS for the base. The image alone makes one lovely card. I decided not to add a sentiment or embellishments on this card. I was not asked to write this or paid for this endorsement. I just love to share items and products when I found something that I really like. Hello! 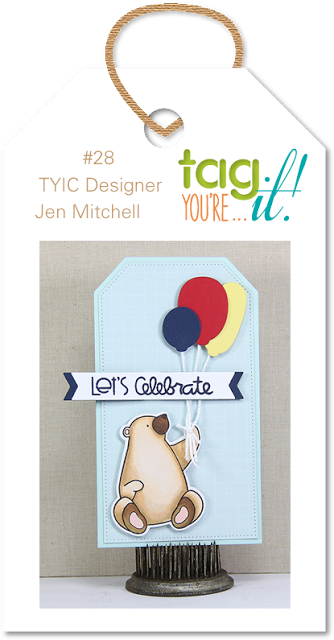 Today I have a tag that I made for Tag You're It! 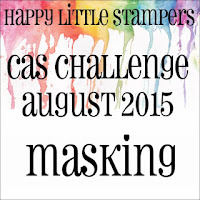 Challenge #28. We are to make a tag inspired by the one made by Joni Mitchell shown on right. I, of course, stayed with a bear theme holding balloons that I cut with a circle die from paper scraps. The bear is a stamp from Creative Clear stamps in Memento Rich Cocoa ink. Word dies are Cheery Lynn. 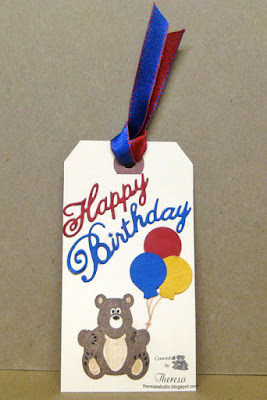 I used a precut Tag and added a double sided ribbon in blue and red to finish. 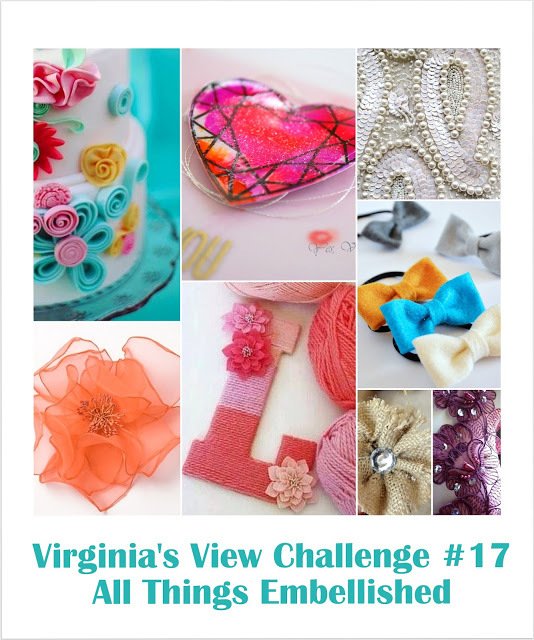 Really Reasonable Ribbon: Challenge #123 is to make Anything but a card with ribbon. Hello! 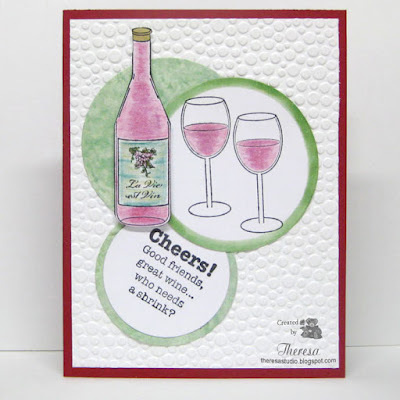 I made this card with Repeat Impressions Wine Series stamps and Memento Tuxedo Black ink using the sketch shown below. I colored the Wine Bottle and Glasses with Pencils and OMS Have a great day! I meant for the color of wine to be Red but it looks more like a Rose. The card base is Cranberry CS with White CS embossed with EF Tiny Bubbles. All papers including the Green Pattern are from my stash. It has been a creative kind of day....I have a lot of card ideas running around in my head. Two weeks ago, I visualized this card the minute that I saw this photo challenge Peaches and Cream at The Shabby Tea Room but I kept trying to come up with something more like a Peach, the fruit theme, but I finally just had to create my original thought into paper and ink. 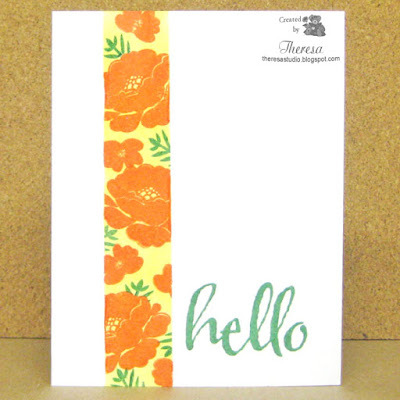 I heat embossed the Hero Arts Leafy Vines stamp with White EP on a Peachy color CS from my stash. This was also spritzed with Gold Glitter Mist but it does not show in photograph. I added Die Cut and Punched Butterflies of Glossy White CS which is also the card base. Finished with a Papers and Such stamp "Fluttering By to Say Hi..." and some flourishes of pearls. I really like my interpretation of this challenge. Guess it is never too late to commit to an idea.....but the challenge is almost ended, better hurry. 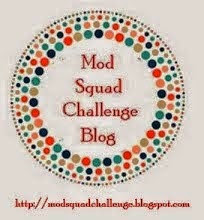 Mod Squad Challenge: Heat emboss the image or background. Today, I am playing with a new Digital Image from Power Poppy called Sunflower Power. I colored this with Copics Y17,23,26, G21, YG63, E15,17, 27 and trimmed with a Spellbinder die. I also printed the sentiment from this set and cut with Circle Die. I assembled the card with Pattern Papers from Fancy Pants Happy Go Lucky pad, a Brown Organza Ribbon, and White card base. This image was so much fun to color. I purchased it as soon as was released a few days ago. On Facebook, Rhea at Passionate Paper Creations is having a coloring contest to use Sunflower Poppy and she has some great prizes. Check it out here. 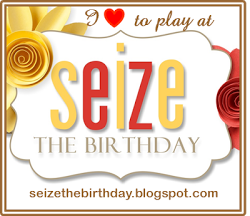 I am entering this card with the hope to wish. Hello! 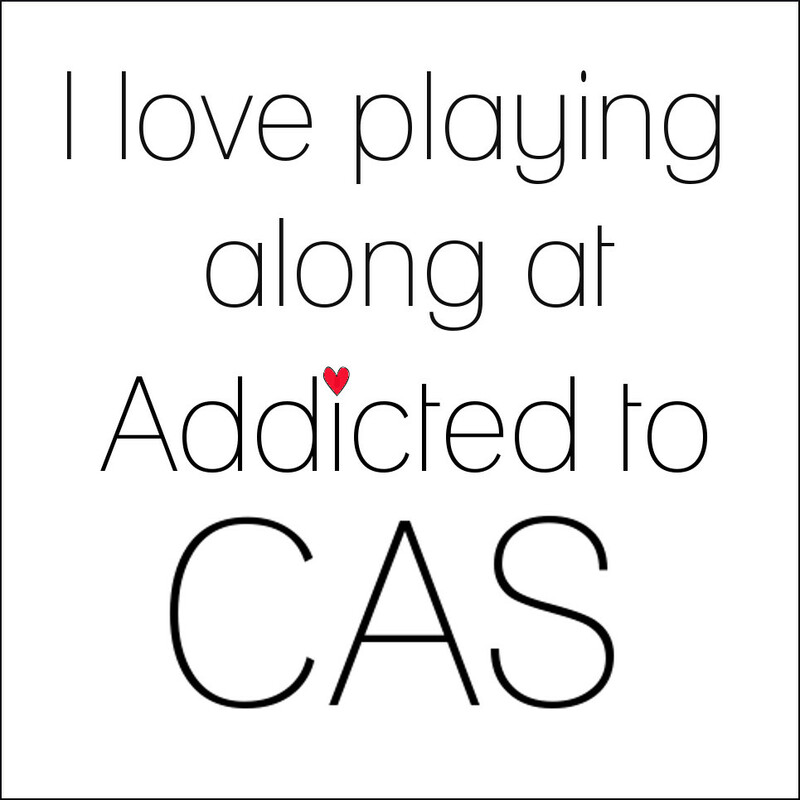 I am back with another One Layer and CAS card using Masking. After masking off an area on a GKD Heavy Weight CS, I sponged the strip with Distress Ink Squeezed Lemonade. Using more masking, I then stamped Flower and Leaf Branches with Avery Elle Petals and Stems set. Inks used were Memento Morocco and Cottage Ivy. The large sentiment from Winnie & Walter was inked with the same green. Hello! I don't do many pastel Christmas cards but I was very pleased with how this turned out with a very soft vintage look. 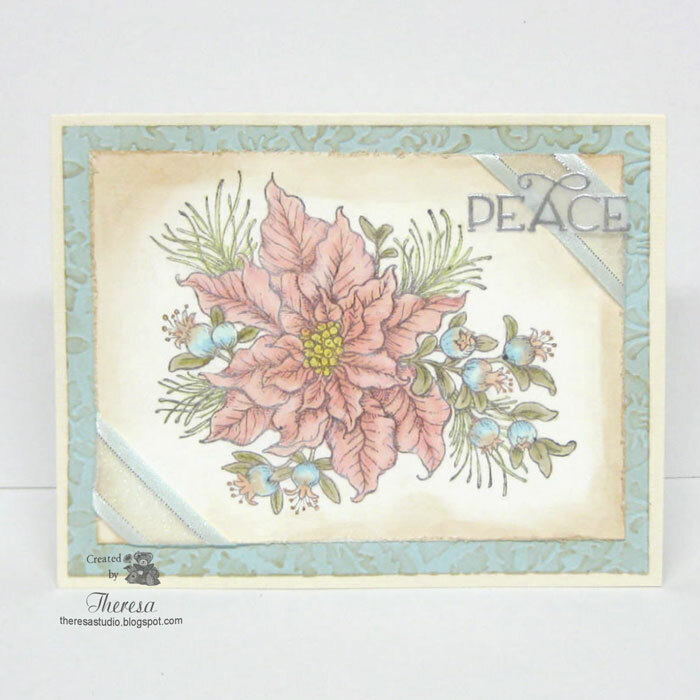 I chose pink colors for the poinsettia accented with soft blues and green. The Power Poppy stamp from the Poinsettia set was stamped with Memento Espresso Truffle ink on Ivory CS and colored with Copics R01,11,20, B0000,21,45,YR00,02,YG81,93 and Memento New Sprout Marker. I distressed the edges and sponged with Distress Ink Antique Linen. The image was attached to an blue embossed layer also sponged with the same Distress Ink. Ribbon of Blue Satin with Organza and Silver Thread was attached to the corners. I heat embossed the sentiment on Vellum and fussy cut the word. This was attached with special tape for using with Vellum. The card base is Ivory Textured CS. I added some more sparkle to the petals with Clear Star Pen but it does not show in photo. 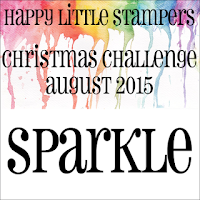 Happy Little Stampers: August Christmas Challenge - Sparkle. I have sparkle in the ribbon, on the silver sentiment and Clear Star on the petals. Hello! I have a second post today for the Cheery Lynn Challenge # 197 Back to Nature. 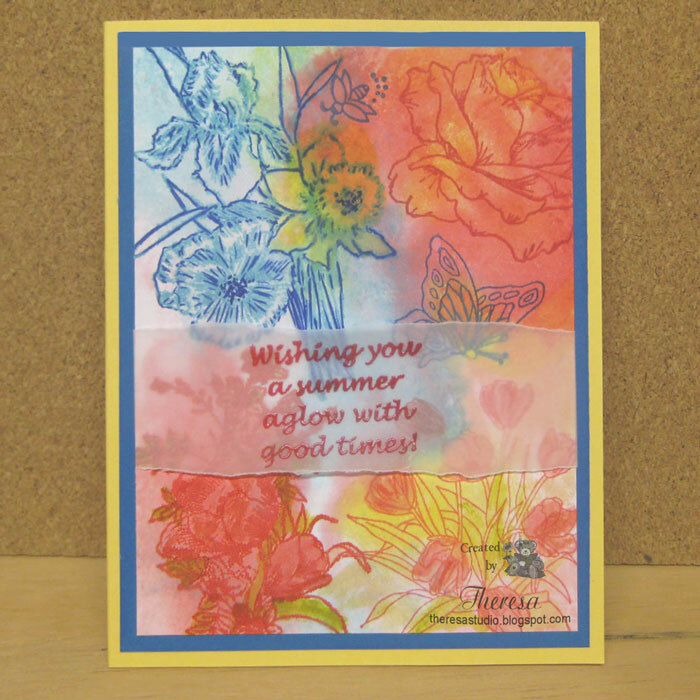 This card was made without stamps or inks being involved. 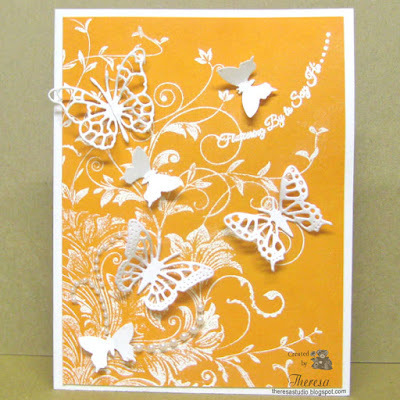 I simply used papers and die cuts to create a scene with Butterflies in a Garden. 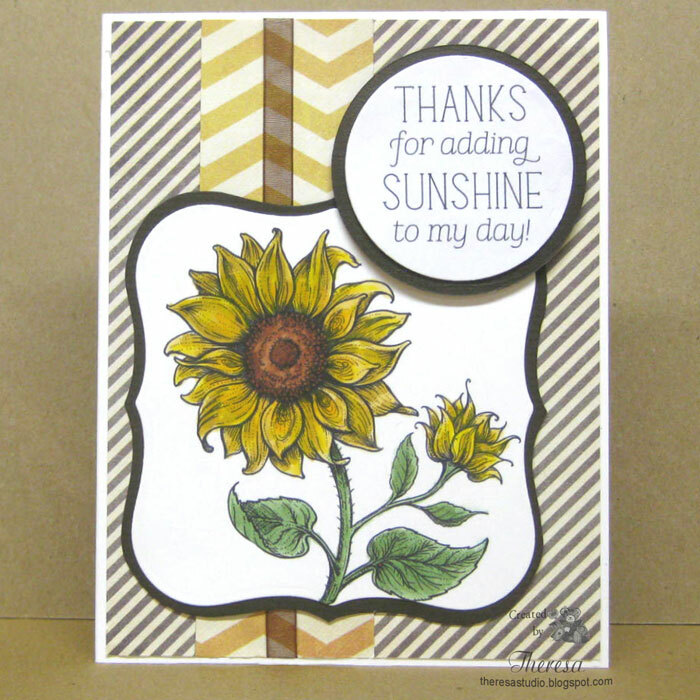 I used some dies I recently purchased with a Gift Credit that I won from Cheery Lynn. Butterflies were cut from Pattern Paper with Small Exotic Butterflies #1 dies and the angel wings were cut in pink CS. The top butterfly on my card was trimmed down from the original size to fit over the printed butterfly on the paper. I used the Thanksgiving Die to cut the word Thanks in another pattern paper.....this die serves double use.....just cut a portion of the word or trim to say Thanks. 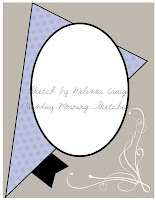 All pattern paper is from ODB Designs Shabby Rose Collection. Pink Base is GKD CS. Wicker Weave EF used. Hello! Today I am sharing a One Layer and CAS card made using Masking technique to stamp a strip of Poppies with a stamp from Power Poppy Poppies set. I stamped the image with Memento Lady Bug ink and colored in the stems with Memento Cottage Ivy Marker, the flowers with green and yellow pencils, and drew lines defining the strip with Lady Bug Marker. 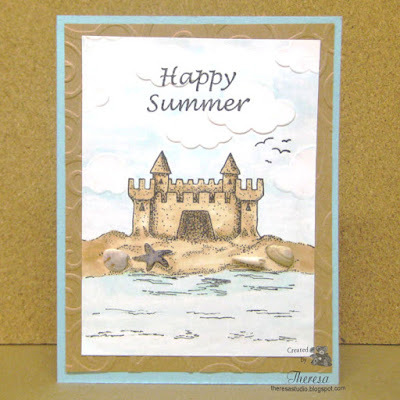 The sentiment was stamped with Cottage Ivy ink all on GKD Heavyweight White CS . I love this as a notecard done as a One Layer design. 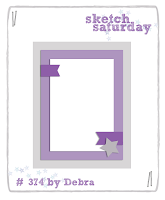 One-Layer Simplicity Challenge: #19 Strip Down - mask a strip down the front of your card and stamp away. Hello! I have made this Christmas card for a few challenges listed below. The Stocking image from Power Poppy Poinsettia set was stamped with Memento Tuxedo Black ink on white CS, colored with Copics, cut with Nesties Oval Die and edged and sponged with Green Ink. Using a sketch from Tuesday Morning, I arranged Polka Dot and Stripe patterns from American Craft, Touch of Green Ribbon, and a Green Corner Die Cut with Spellbinders Regal Frame with the image. Placed this on a Textured Ivory CS base. Added a sentiment stamped on Vellum and heat embossed with Gold EP for some sparkle. 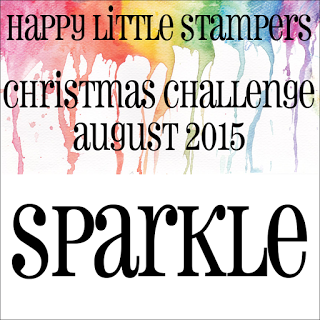 Happy Little Stampers Christmas Challenge: Use Sparkle. Gold embossing sparkles on the sentiment. Welcome! Today I made a card for the Mix It Up Monday Challenge from Cat at Stamp TV. Her Theme is Where's the Colors? and we are to use Black, White, and Kraft. I am using some elements that I won in a Grab Bag from Gina K Designs: Die Cuts - An Oval Design and a Border Design cut out of Black CS, an Oval from White CS and a GKD stamp from Thankful Ovals set. This was a great grab bag! 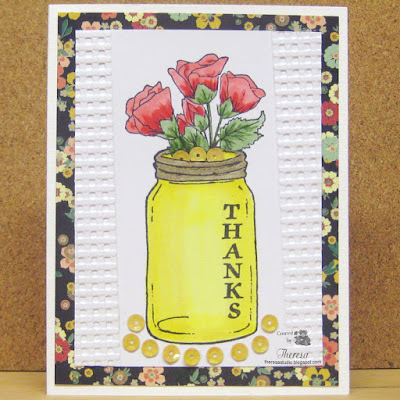 I stamped the Thank You on the white oval cut out with Memento Tuxedo Black ink and layered it on the Black Oval cut out and attached to a Card base of Kraft CS that I embossed with Cuttlebug EF Wicker Weave picking up the pattern on the stamp. I finished by adding the Border cut out at the bottom edge. Easy peasy! Hello! I hope everyone is enjoying the Summer but it is going by so quickly. Has everyone had some Sun, Surf, and Sand this season? Cheri at The House That Stamps Built is asking us to create with those elements this week. My Card features Repeat Impression stamps that I colored with Copics after stamping with Memento Tuxedo Black ink on white CS. 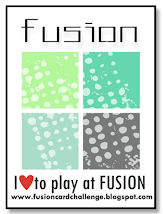 The embossed( EF Clouds) image was layered on embossed (EF Divine Swirls) Kraft CS and then a base of Blue/Turquoise CS. I added some Glossy Accents to the Starfish and added some "real" Seashells, from my fun days on the beach, to finish. I always love when I can used natural items as embellies. Repeat Impressions Designer Choice Challenge: DCC812 Sun, Sand, and Surf. 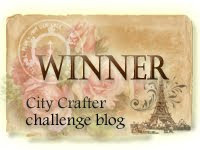 City Crafter Challenge: #274 Be inspired by the Mood Board. I was inspired by the beach and seashells. Allsorts Challenge: Week 323 Inspired by Summer. 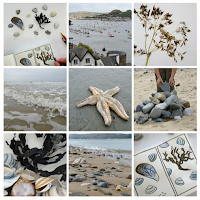 Inspired by the beach, sand and shells. Today I am going to share my Studio from its beginning to present day for you. My Studio was located in our unfinished basement and was established when we remodeled our kitchen in 2004. 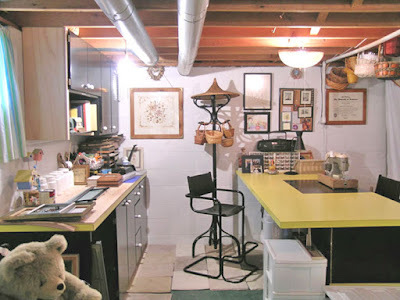 It began with my idea of salvaging some of the cabinets and the counter from the old kitchen and relocating them into unused space in the basement. 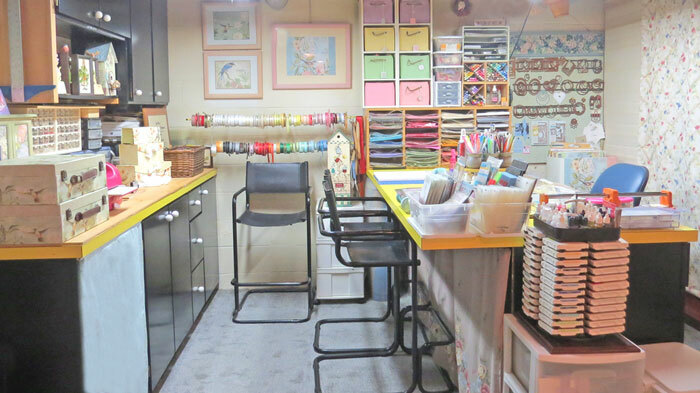 It had long been a dream of mine to have a dedicated space for sewing and crafting even long before I began card making so it really began as a space for sewing and crafting. Now you have to understand that I never liked the Black and Yellow motif in our kitchen even when we purchased the home in 1978 but I waited until we could have our dream kitchen before I tackled a remodel. And I am a believer of using old items for another use and not throwing away usable ones. 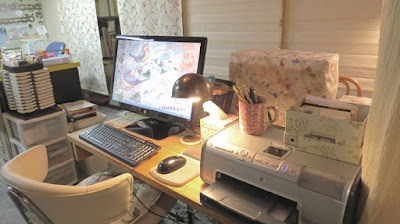 As you can see, my sewing machine took center stage on the counter. I covered the unfinished floor with carpet samples and only had one overhead light. 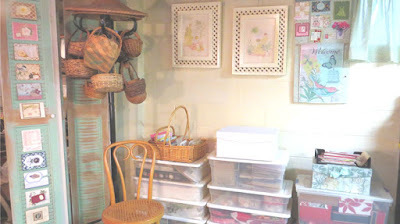 Everything in the studio were items that I already owned - chairs from the old kitchen, baskets from my collection (mostly garage sale finds), an old hat rack, framed pictures, etc. 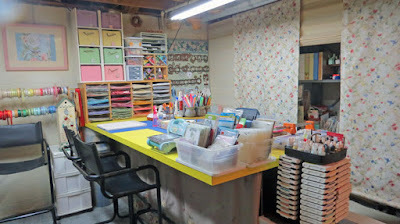 The left counter was set up with a plywood top to use for framing and other crafts. I do admit that I like the kitchen counter and cabinets better here than I ever did in the kitchen. By 2009, the area evolved. 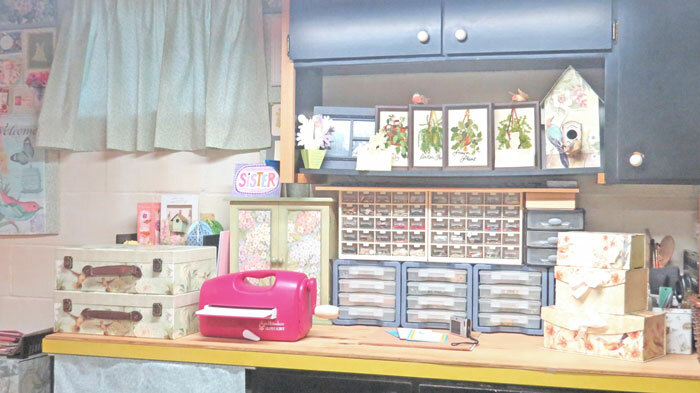 I now have stamps, ribbons, dies and card making elements featured in the area and the sewing machine has moved to a less used area. 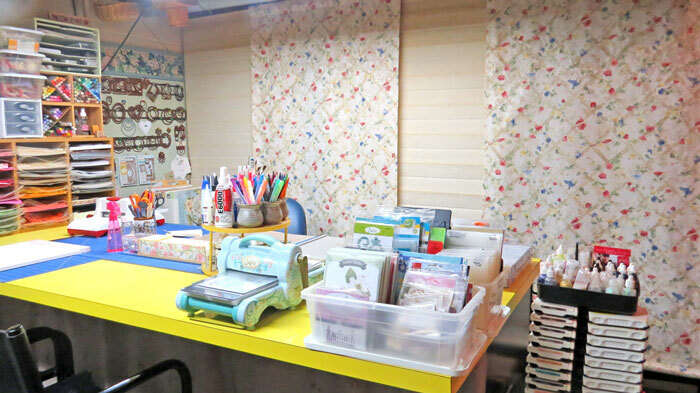 The metal shelves on the right used for storage of seasonal items and other miscellaneous items were hidden by panels that I covered with sliding panels of fabric (salvaged from old blinds from a previous home) on the right of the studio area. 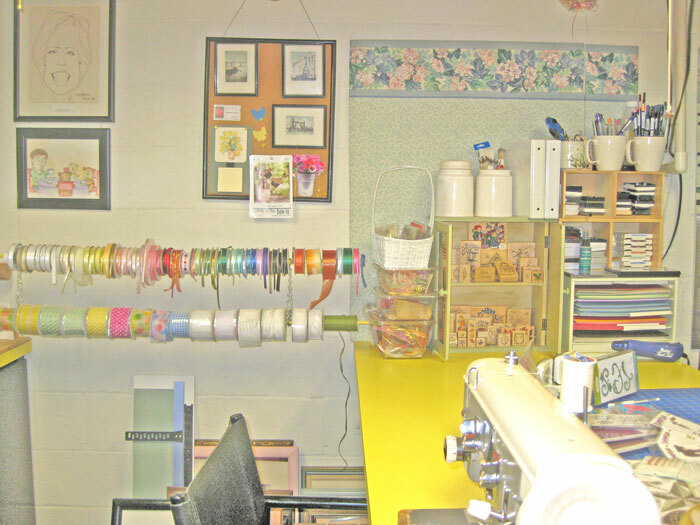 Ribbons were stored on poles that I hung from the ceiling, The area was now adapted for card making supplies. The floor was covered with carpet tiles that I laid and fluorescent lights were installed by my DH for improved lighting. By 2012 my studio shown below was packed with frames collected at garage sales, more ribbons, shelves and storage of cardstock, supplies for card making, storage for Copics and Memento markers and inks, bins for flowers and other embellishments, dies stored on a fabric covered board with magnetic strips, and the counter top adapted for use to make cards rather than for sewing. The storage units were basically all purchased at garage sales or items repurposed that I already owned. 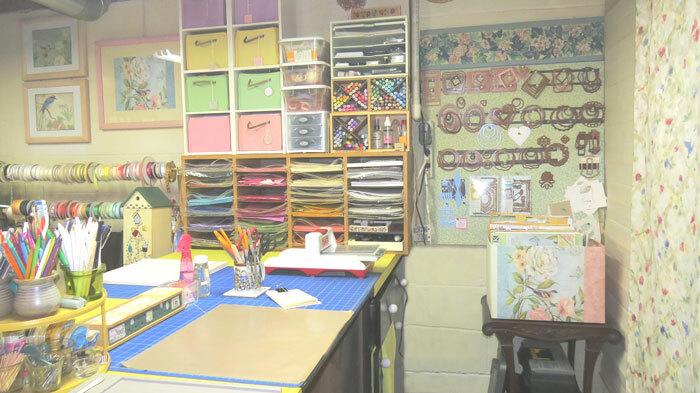 Today my studio has been given a fresh look, rearranged to hold more tools and elements for card making, decorated with different items that I owned, and new/old covering for the wall of storage shelves. The only items that I purchased to add a new look were 4 1/2 yards of fabric from Joann's (50% off with 20% coupon) and a Susan Winget Paper Pad. Other décor and fabric were recycled or repurposed from other uses. Recycled closet doors instead of fabric panels are now used to separate my area from the rest of the basement that also houses my DH's office. Doors are now used to display cards that I have received. Neatly arranged storage bins hold fabrics, boxes and craft items. The counter on the wall side holds decorative boxes for cards, plastic containers for buttons and embellishments, framing supplies, and other tools. My seldom used Grand Calibur is handy when I need it. This space is also used for photographing projects. I have added fabric underneath to hide open storage. 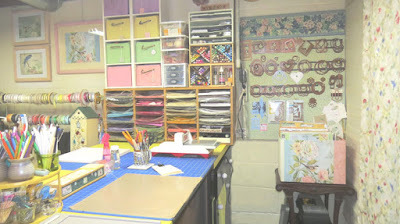 This view shows the back wall with ribbons on the left beneath framed Susan Winget prints in recycled frames. Under the ribbons are bins with gift wrapping supplies. 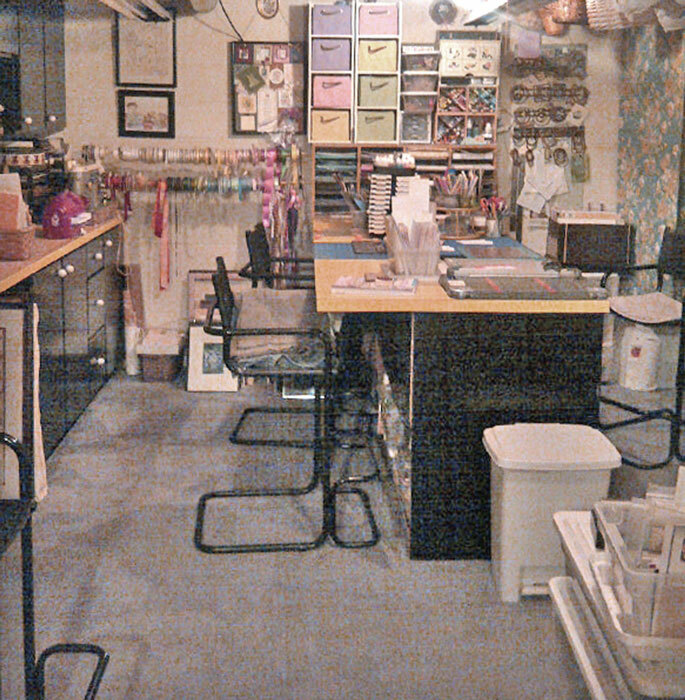 The center wall (at end of counter) holds storage for solid 8x11 Card Stock, Copics , Markers, Ink pads as well as labeled bins for loose ribbon, flowers, etc. On right side of the wall, I expanded the cloth covered bulletin board ( from an office in the past) to house Nestabilities on magnetic strips. The counter holds my Big Shot (dedicated for dry embossing) with embossing folders and my Big Kick on the other side for die cutting. Also close at hand on the counter are the paper trimmer, Scor-pal, Misti, and a turn table with tools used the most. The wall behind the counter holds metal shelves for seasonal decorations and boxes of other stored items. I devised a system of hanging fabric panels that slide to access the shelves. I replaced some of the panels 2 years ago with Roman Shades (which can be raised up and down or slide) that had been in the living room. This month, I added new fabric print panels to replace the old blue floral print panels that I had used. I love the soft coloring of this new print. 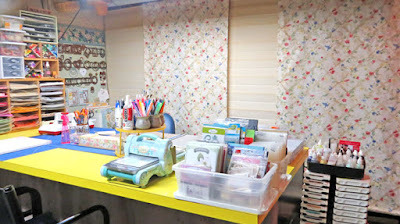 This view shows the side that I use the most for card making. The side table holds 12x12 papers. 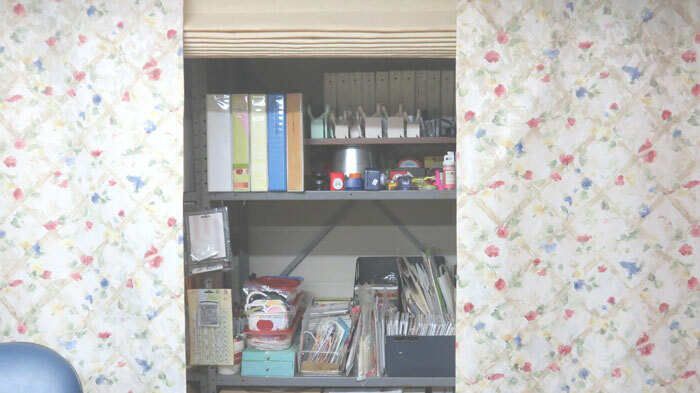 I also use a section of the metal shelving for storing notebooks filled with clear stamps, punches, pattern paper pads, and more. I raise one of the Roman shades for easy access shown above and below. Close up of shelves behind my work area. There is great storage underneath the counters which I have not shown. Recently, I hung fabric found in my stash to hide the back side of the center counter but drawers and doors (not shown) are accessible from the other side. 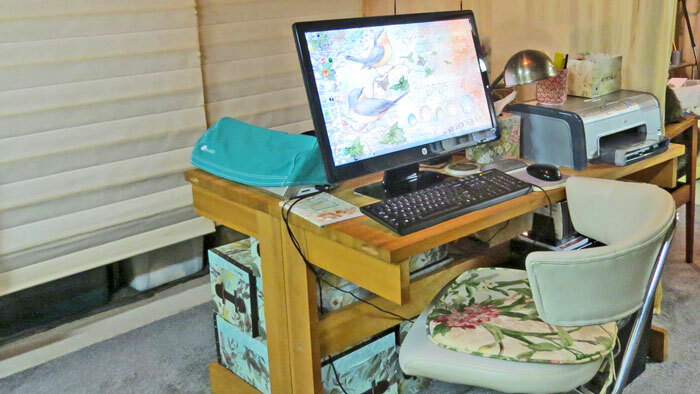 Adjacent to my work area, I have a space for my Computer, Printer, Cameo, and Sewing Machine all on a Butcher Block table (used in a former kitchen over 37 years ago). 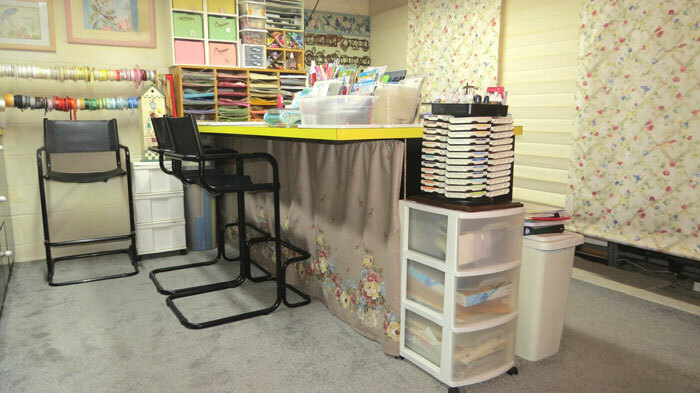 I recently rearranged this area adding my sewing machine which I updated with a new fabric covering to match the wall panels. My computer used to be on the second floor but it is so convenient to now have it in my studio. 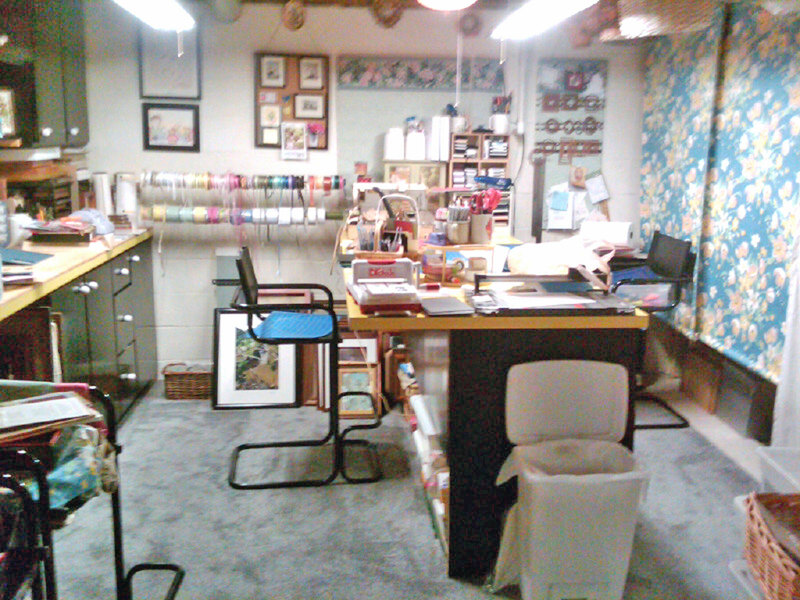 I do hope someone takes the time to read about my studio. I have enjoyed sharing it with you. It has been fun to take old things and make use of them in new ways and also be functional at the same time. 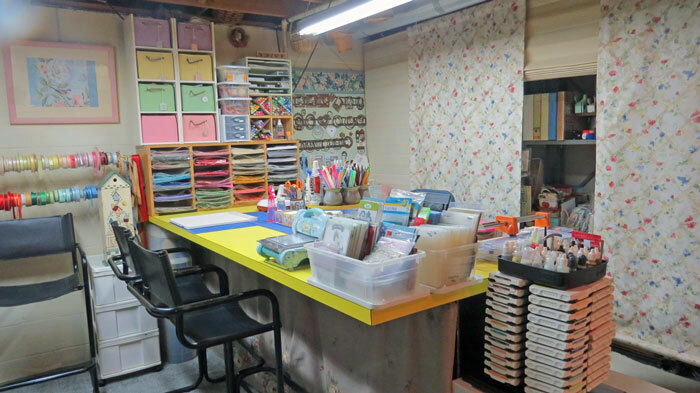 My studio may not compare to ones that I see in magazines, Pinterest, and online with every detail planned but I find it a great place in which to create. Thanks for stopping by. I would love to hear your comments. The story of this kitchen is another one to be told at some other time.